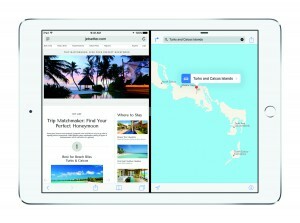 For people who own (or are considering purchasing) an iPad, the forthcoming release of iOS 9 is the biggest most exciting event since the iPad was released in 2010. There’s been a long-standing debate about the iPad. The question is: For those who use a MacBook to get work done, is it practical to replace your MacBook with an iPad? I mean completely replace, as in selling your MacBook and going “all in” with the iPad. For people such as myself, whose work (at least prior to my retirement) consists mainly of writing, the question boils down to: Can the iPad function as one’s primary (maybe even exclusive) writing tool? For the fortunate few (and I include myself here), the question can seem inconsequential. I own both a MacBook and an iPad. I typically take both with me when I travel. And, at any given moment, I grab whichever device seems best suited to the task at hand. End of story. But for many others — due to financial constraints or a need to limit one’s travel load or perhaps just for the sake of simplicity — there is a preference to get by with just one of these devices. The question is: Which one? For most, the answer these days has been trending towards MacBook. There has certainly been a significant decline in iPad sales in the past year, while laptop sales continue to grow. One of the popular proposed explanations for this trend is the success of the iPhone 6 Plus: its larger size can eliminate the need to own both an iPhone and an iPad. Whatever the explanation, I can tell you this: The iPad has been far from the ideal digital device for serious writing. A MacBook bests an iPad on almost every measure here. True, you can make do with an iPad. But you’ll have to work harder to do so. And, no matter how hard you work, there will still be a significant productivity cost. If you’ve ever done extensive typing and editing on an iPad, you know what I mean. Using the loupe tool to move the cursor around is a pain. Cut and paste is much more time-consuming and prone to error on an iPad than on a Mac — especially if you are working across applications. Style formatting is more difficult. Simply adding web links can be a major chore. And on and on. Yes, a few iOS text apps (my favorite is still Textilus) offer features (such as cursor keys and short cut toolbars) that overcome many of the hassles (although there is an irony in touting the advantages of cursor keys, a feature that the Mac largely abandoned when it introduced the mouse). Adding a Bluetooth keyboard to an iPad can similarly be a huge productivity boon. Even so, it’s still more work to do writing work on an iPad than a MacBook. This is where iOS 9 potentially changes the game — bringing the iPad to near parity with a MacBook. Coming exclusively to iPads are QuickType and Multitasking features that represent the final pieces in a jigsaw puzzle that Apple has been assembling since it first added cut-and-paste to iOS devices years ago. With Split View (available only in the iPad Air 2 for now), Slide Over and Picture in Picture, you can finally interact with two apps simultaneously. With the new QuickType “trackpad simulator,” you can move the cursor around much like you do on a Mac, eliminating the need for the loupe tool. There’s now a system-wide shortcut toolbar. There’s even a Mac-like app switcher than you can call up with Command-Tab on a Bluetooth keyboard. I’ve tested all these out with the iOS 9 beta and can attest that they work pretty much as advertised. The jigsaw puzzle metaphor is not perfect; there are still improvements I’d like to see (the ability to drag-and-drop selections across split-screen apps is one obvious example). As with any digital technology, the picture will never be completely finished. But you get the idea. The major pieces are all in place, the refinements are coming. These new iOS 9 features are just the software side of the equation. On the hardware side, if the rumor mills are accurate (and I believe they are), a new larger “iPad Pro” will be coming this fall. It should introduce further productivity enhancements. I’ve recently expressed some doubts about the viability of an iPad Pro. But after seeing iOS 9, I’m much more positive. I’ll reserve final judgement until the end of the year, but I’m feeling optimistic. The bottom line? For those who need a computer to get work done (especially writing work) and have been hoping for a time when the iPad alone could function as that computer without significant compromises, it looks like that time is about to arrive. This entry was posted in Apple Inc, iOS, iPad, Mac, Technology. Bookmark the permalink. Yup. I have a bit of worry that I may yet eat my words. I know I can get overly enthusiastic when I first start working with new features. The iPad will never fully duplicate all the advantages of a MacBook. If it did, it would be a MacBook, not an iPad. :) But an iPad has its own advantages. If you prefer those advantages and if it becomes reasonably efficient to do long writing tasks on an iPad (as I am expecting it will with iOS 9), that could be enough to allow the iPad to be one’s primary or exclusive portable machine. We’ll know for sure soon enough. I assume (and others have pointed out) that it is this sort of memory issue that led Apple to limit Split View to just the iPad Air 2.